Please click this and help me win! Please click this link to help me win! I really do hope I win this! Survival contest that I want to win! It's been a while! Whew It feels good to be listing new items and having something to look forward to as far as sales go. I recently became unemployed so I'm really hoping my sales from these new items will help me be able to afford the Holidays and be able to feel as if I'm actually participating. I tell you, life has been a doozie for me lately and not so much in a good way. Anyway here's my new items I hope they tickle your fancy and tempt your cozy desires! They are all super warm and already washed so they will not shrink. I would advise hand washing though just to prevent the dryer from ruining the lace and causing the yarn to fray. All are Located Here CLICK HERE!!! New item in my store! This one was a ton of fun to make and it wont last long! One of a Kind Wall cross! This is a good one too! Inexpensive and crafty I love this easy tutorial for making spooky candle holders! I'm kooky enough to leave these out all year long! My favorite time of the year! 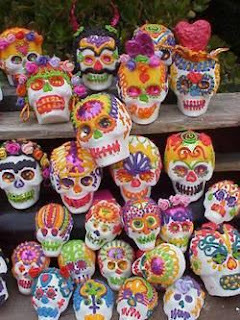 My Birthday just passed on October 4th and my favorite holiday is on her way Dia del Los Muertos!! Day of the Dead! I love everything that encompasses this artistically beautiful holiday and am going to be sharing a lot of my finds until then! I do hope you enjoy them all! Today I found a super easy recipe with video on how to make simple sugar skulls out of dollar store products! These are also called Calaveras if you're looking for beautiful pictures for decorating ideas!